Princeton, N.J. When Colonel Henry Steel Olcott landed by ship in the southern coastal town of Galle in the British colonized island of Ceylon (now known as Sri Lanka) on May 17th 1880, the natives of that island were cocooned in their own culture and religious practices. The British colonial system had changed much of the population’s two thousand year old religious and educational system and brought it under the aegis of the British Crown. Colonel Henry Steel Olcott landed in “Ceylon” (Sri Lanka) in 1880. Photo: Kevin Jayawardena. Two millenniums earlier Buddhism, in its’ purist form, had been brought to the island by sacred Buddhist monks from India, and at the time of Olcott’s arrival, had been relegated to four meager temple schools. British assisted Christian schools were over 800 in number. Colonel Henry Steel Olcott, left the shores of the United States in 1878 looking for Buddhism and oriental wisdom and ended up devoting the last three decades of his life to its revival. Juxtaposition between America and Sri Lanka in New Jersey. Photo: Kevin Jayawardena. The last years of the 19th century saw a remarkable American come to Sri Lanka, a man who came not to convert but to learn; the dedicated Colonel Henry Steel Olcott. 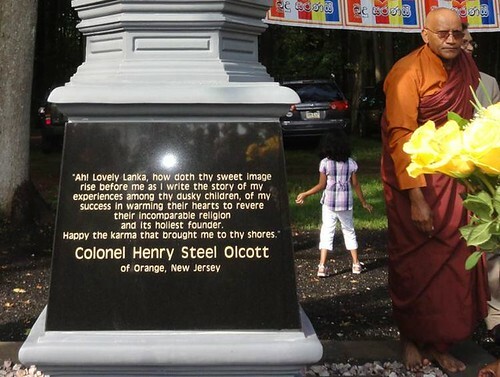 Col.
Olcott is remembered with love and gratitude by the Buddhists of Sri Lanka, since he reawakened the nation and inspired them to struggle for their legitimate rights. By petitioning the British authorities in London, he regained Wesak (Buddha’s birthday) as a legal holiday and guaranteed the registration of Buddhist Weddings under the colonial administration. He founded schools, laid the foundation for a national system of education and paved the way for the national movement which succeeded in its’ struggle for independence more than half a century later. The schools that Olcott founded taught the nation’s children to value their civilization and culture. As a mark of gratitude a life size statue of the former savior of a nation, military officer, journalist, lawyer, member of the commission to investigate the President Lincoln Assassination, and the co-founder and first President of the Theosophical Society of New York will be unveiled at the serene and sprawling grounds of the New Jersey Buddhist Temple, in Princeton, N.J., on September 10th at 3pm. 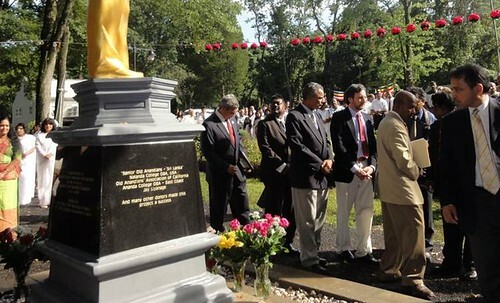 The statue is a gesture and a tribute from the Alumni from the ”˜Olcott Schools’ of Sri Lanka, a group of more than 400 schools that originated from the Buddhist education revival movement championed by Colonel Henry Steel Olcott, and Mr. Tilak Ranaviraja and family, former Deputy Ambassador to the Sri Lankan Embassy in Washington D.C. The New Jersey Buddhist Temple hosted the Colonel Olcott gathering. Photo: Kevin Jayawardena. Colonel Olcott was born in Orange, New Jersey on August 2, 1832 oldest of the six children of businessman Henry Wyckoff Olcott and Emily Steel Olcott. Having completed his secondary schooling in New Jersey he attended the College of the City of New York and then Columbia University. International dignitaries and guests attended the Princeton event. Photo: Kevin Jayawardena. Olcott served in the U.S. Army during the Civil War under General Burnside, and was later appointed by Secretary of State Stanton, as Special Commissioner to uncover corruption in Navy Yards and Military Depots in New York. He was later promoted to the rank of Colonel and transferred to the Navy Department in Washington, D.C. When President Abraham Lincoln was assassinated, Olcott was appointed to the investigating commission. Later he studied Law and after admission to the Bar in New York, practiced it for a few years. In early 1870s Olcott became interested in the Spiritualist movement. In 1875, Olcott and Ms. Helena Blavatsky, with several others formed the Theosophical Society in New York City. In December 1878 he left New York to India. There Olcott established and bolstered movements of the native cultures and religions to fight the repressive effects of the British colonial rule. Olcott arrival in Sri Lanka (then Ceylon) in 1880, and would also help local organizational efforts with typical “Yankee impatience and efficiency”. One of the most impressive aspects of the Olcott’s work in Sri Lanka is the continued success of the movements he created. Colonel Olcott died in Adyar, India on February 17, 1907. Around his body was wrapped the flag of the United States and the Buddhist flag he had created for Buddhism around the world. The statue unveiled was created by a Sri Lankan sculptor and is based on the Olcott statue in the busiest street named after Henry Steel Olcott in Colombo, Sri Lanka. On the day of the unveiling of the statue, an exhibition of photographs related to Colonel Olcott’s service and the screening of a short biographical film took place. The New Jersey Buddhist Temple is located at 4299 Route 27 in Princeton, N.J.
Dr. Wije Kottahachchi is president of the ACOBA-EC (Ananda College Old Boy’s Association East Coast USA).